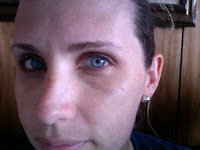 Word to the wise...when your garden hose gets tangled don't try to flap the hose until you shake it loose without taking off the watering wand first...You might just get a black eye. Ouch! Welcme back, I missed you. Your military story was hilarious. Thank goodness they are keeping the world safe from all threats - including wandering moms and kids!